Though not a space band, Rivendell's connection to the SpaceRock family tree is that Dark Sun's vocalist Janne Kuokkanen is the singer on this 22 minute CDEP. That said, the four songs on this mini disc are a fine example of progressive rock along the lines of IQ, Kansas, and a host of other bands like those found on the Cyclops and Magna Carta labels. Besides Kuokkanen (who has since been replaced by Janne Hirvonen) the band includes Kristian Toyra on keyboards, Mikko Makela on bass, Miika Makinen on guitar, and Kari Heiskanen on drums (since replaced by Oskari Heiskanen). 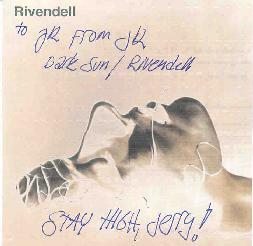 The name Rivendell is taken from the Lord Of The Rings saga and certainly the lyrics are based in fantasy. Kuokkanen is a powerful vocalist and will be instantly recognizable to Dark Sun fans. The guitars have a heavy crunch sound though this isn't by any means metal. The keyboards are typical of the neo-prog genre though there is also a lot of piano, especially during quieter moments. The band can really rock out but keeps the pace shifting in musical storytelling fashion. Though this is the band's only release to date they have played shows during 1998.